CREATURE TEACHER: Building a reward system, or "My dog won't work for food"
Building a reward system, or "My dog won't work for food"
Getting an animal to work for food is sometimes a little bit tricky. It is absolutely worthwhile, though, even if you have your animal working for another kind of reward. Food as a reward comes with several advantages. For example, it can be delivered and consumed very quickly so that the flow of the training is not disrupted and more repetitions can be fit into a short training session. It can also be delivered slowly (e.g. in lots of little bits one after another), stretching out the moment of reinforcement to make it seem like the animal has just hit the jackpot. It's a very flexible kind of reward. It can increase and decrease arousal, it can be delivered close to you or farther away, it's easy to carry, and it's one of the most reliable ways to improve emotional state, so invaluable for behaviour modification. If your dog (or other animal) currently won't work for food, don't write the whole thing off. All animals will work for food. They have to eat, after all. Work through the following steps and pretty soon your animal will be working for their regular food whenever you give them the opportunity. Animals won't eat unless they feel safe. If an animal is not safe it is just like when we are very anxious. Our stomach roils and we may even feel nauseous. We do not want to eat. They feel much the same way. Therefore, the first step in building a food-based reward system is to make sure your animal is comfortable with the environment. This means they are comfortable with their surroundings, the other animals and people in it, and the trainer. With dogs we tend to skip this step because many of them are very opportunistic about food and always seem ready to eat, but I can't emphasise enough how important it is to keep in the back of your mind. If you have a dog that is glancing around a lot, staring at other things in the environment, or seems very distractible or unwilling to move much, chances are the dog is not comfortable in the environment. For other animals you may see freezing and staring and a lack of response to you or any food you offer. The fix for this is desensitisation. Give them time to just take in their surroundings and get used to it. If they are in a whole new place, like they have just been rehomed, give them a few weeks. If they are in novel or unfamiliar surroundings but have a good relationship with you, give them a few days or sessions in those surroundings. If they are still not comfortable you can help them along with some counter-conditioning and active desensitisation. Stay tuned for an article detailing this. Some animals have not really had the opportunity to realise that food is something they actually can have control over. They are used to having it dished out to them and left to eat it in their own time. They don't know there might be other ways to get food, or that it might be much better than what they are used to. Other animals may naturally eat food that doesn't exactly run away from them, like grass. Basically they can eat whenever they feel like it and they won't have the motivation of a more opportunistic animal like a dog to take advantage of when it is available. My preferred way of handling this is to find a food the animal particularly likes and make sure they only ever get it from my hand. For dogs, fresh or cooked meat is usually a winner. For very fussy dogs, try cooked heart. I boil lamb hearts in a saucepan until they are cooked through and then cut them up small. For herbivores, sometimes fresh fruit can hit the spot, or a favoured vegetables. I've had success with berries and carrot tops (the leafy bit from dutch carrots is a rabbit favourite). Grain-eating birds can be trickier. Watch what grains they choose first to work out their favourites. Try dark, oily seeds like a canary tonic mix, or egg and biscuit. For parrots, you may find fruit and nuts or a commercially available treat work. Make sure you check with experts if your animal's treats may cause health or digestive problems. Once we have some tasty rewards to choose from and our animal is interested in us and our food, then it just comes down to practising working for food. Many companion animals just don't realise they can earn food any time. If they can only earn food at meal times, or in training sessions, then how will they know it's worthwhile listening to you at other times? Make it really easy for them to earn food. They need to learn that just interacting with you pays. Making eye contact, following you, staying close, following gestures, and of course, lots of sits and downs. I love a default sit or down. Keep treats handy and play a game of trying to surprise your animal with treats or opportunities to earn treats when they are not expecting it. Note: This may work better for dogs than other animals. Transitioning to using treats other than the amazing ones you found in Step 2 is quite easy. Wait until your animal is looking for a treat. This will usually happen a few days into Step 3. They will do something that has recently been rewarded and their ears will come forward and they will look at you and may dance around a little in anticipation. This is when you can try popping them a different treat. If they won't take it, go back to the good one for another day or half a day, then try again. If they do take it, good! Start offering it only 20% of the time at first, then after a day or so, move to 50% of the time, then 80%. Once you get to about 50% of the time, introduce a third treat in much the same way. Phase out the best treats at the same time. It is good to save these ones for when you really need them. Next step - the big wide world. 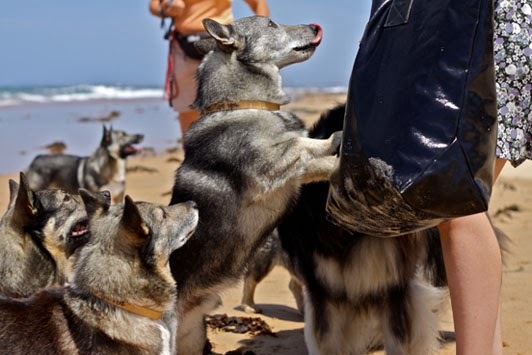 These dogs are in the habit of looking to humans for rewards, even somewhere as exciting and full of rewards as the beach. It's easy to trip up, here. I know it's a drag, but if you have treats on you all the time you will see things to reward and you will have the means to do so. Why be stingy? The more opportunities your animal has to earn rewards the more attentive they will be to you. Once you get into the big wide world (if you take your animal there), they may completely forget about treats and earning food. It's okay, just be patient. The work you put in here will pay off in a big way. Go back to Step 1 and work through the protocol again somewhere that is not the most exciting place on the planet. You need to have your animal relaxed enough that they can stop running around and be content to look around instead, or even sit or lie down. Alternatively, teach them a cue that means "I have your favourite treats right here, right now." Use the amazing treats you discovered in Step 2 and pair them with a word or sound. I use "Hey! ", but other people use a kissy sound, or clicked fingers, or "Oi!". Start at home, and every time you say the word, wait for your animal to look at you and then feed them the amazing treat. Do this a lot. Until when you say the world they whirl towards you. This can sometimes help you get your foot in the door once you are out in the world again by getting their attention. Remember not to ask much of your animal at first. Be a good bet. All they need do is look at you when you say their name and you can reward that. If you ask for a sit, expect a one second sit and reward it if you get it. You can work up to more attention and longer sits later. To begin with this is all about teaching your animal that you frequently have good things for them, so it's worth their while to keep track of you and listen to you. If you can get their attention you're 90% there.